ARIES (March 21-April 19): Freedom is the most important kind of joy you can seek right now. It’s also the most important subject to study and think about, as well as the most important skill to hone. I advise you to make sure that freedom is flowing through your brain and welling up in your heart and spiraling through your loins. Write synonyms for “freedom” on your arm with a felt-tip pen: liberation, emancipation, independence, leeway, spaciousness, carte blanche, self-determination, dispensation. Here’s one more tip: Connect yourself with people who love and cultivate the same type of freedom you do. TAURUS (April 20-May 20): It’s Love Your Messes Week, Taurus. In accordance with the astrological omens, you are authorized to love the hell out of the messes in your life -- from the small, awkward knots of confusion to the big, beautiful heaps of fertile chaos. This is not a time to feel embarrassed or apologize for your messes; not a time to shy away from them or ignore them. On the contrary, you should explore them, celebrate them and even take advantage of them. Whatever else they are, your messes are untapped sources of energy. Learn to love them for the mysterious lessons they keep teaching you. Love them for the courage and willpower they compel you to summon. Love them for the novelty they bring your way and the interesting stories they add to your personal legend. GEMINI (May 21-June 20): “A snowball’s chance in hell” is an American idiom that’s equivalent to saying “it probably won’t happen.” After all, a snowball would instantly melt if exposed to the scorching fires that rage in the underworld. But what if there’s an exception to this axiom? Let’s call on another American idiom: “When hell freezes over.” It’s another way to say “it probably won’t happen.” But the truth is that now and then a cold front does indeed sweep through the infernal region, icing its flames. When that happens, a snowball’s prospects of surviving there improve dramatically. And that’s exactly what I predict will happen for you in the coming week. 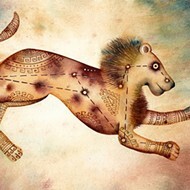 LEO (July 23-Aug. 22): When you see your shadow, it’s usually right next to you. It’s there on the ground or floor, a fuzzy black shape that follows you around closely. But today I saw my shadow waving back at me from afar. I was standing on top of a hill, and the sun’s rays created a dusky version of me in the meadow way down below. I think this is a useful metaphor for an opportunity that’s available to you. In the coming days, you will be able to view the shadowy, undeveloped parts of your personality as if from a distance. That means you will have more objectivity about them, and thus greater compassion. You can get a calm, clear sense of how they might be mucking with your happiness and how you could transform them. VIRGO (Aug. 23-Sept. 22): “You cannot use butterfly language to communicate with caterpillars,” said psychologist Timothy Leary. That’s good advice for you to keep in mind in the near future. You might want to find a way to carry on constructive dialogs with people who have a hard time understanding you. It’s not necessarily that they are stupid or resistant to your charms. The problem is that they haven’t experienced some of the critical transformations you have. They can’t be expected to converse with you in your butterfly language. Are you willing and able to speak caterpillar? 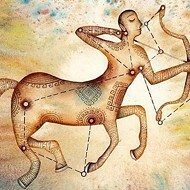 LIBRA (Sept. 23-Oct. 22): Are you thinking of linking your fortunes to a new ally? Or deepening your collaboration with a familiar ally? Have you fantasized about bonding intensely with a source that may be able to give you more of what you want and bring out more of the best in you? These prospects are worth contemplating, Libra. But I suggest you let your connection ripen a bit more before finalizing the shift. I’m not necessarily saying there’s a potential problem. I simply suspect that you need further exploration and additional information before you can make the smartest move possible. SCORPIO (Oct. 23-Nov. 21): Saturn has been in the sign of Scorpio since October 2012 and will be there until the end of 2014. (It will make another visit from June to September 2015.) What does that mean? I have a view of Saturn that’s different from many astrologers. They regard it as the planet of limitation, struggle and difficulty. Here’s what I think: While Saturn may push you to be extra tough and work super hard, it also inspires you to cut away extraneous desires and home in on your deepest purpose. It motivates you to build strong structures that free you to express yourself with maximum efficiency and grace. SAGITTARIUS (Nov. 22-Dec. 21): When I took an intermediate painting class in college, our first assignment was to imitate an old master. My choice was the Flemish painter Pieter Breugel the Elder (1525-1569). I worked on reproducing his painting The Fight Between Carnival and Lent as precisely as I could. It was tedious and liberating. I invoked Breugel’s spirit and prayed for his guidance. I sank my psyche deeply into his. By the end of the four-week process I’d learned a lot about painting. Given the current astrological omens, Sagittarius, I suggest you try something similar. Pick someone who excels at a way of working or a state of being that you would like to master yourself, and copy that person for a while. For best results, have fun with it. Play! CAPRICORN (Dec. 22-Jan. 19): Capricorn author J. R. R. Tolkien spent 14 years working on The Lord of the Rings. In using a typewriter to produce over 1,200 pages, he relied solely on his two index fingers. He never learned the ten-finger typing method. I suppose it didn’t matter in the end. Presumably, his impediment didn’t affect the quality of his work, but only made it harder to accomplish and required him to spend a lot more time. Is there a fixable limitation on your own ability to achieve your dream, Capricorn? Is there some handicap you could, with effort, overcome? If so, now would be an excellent time to begin. AQUARIUS (Jan. 20-Feb. 18): “The truth’s superb surprise,” wrote poet Emily Dickinson, may be “too bright for our infirm delight.” Sometimes we’ve got to be careful about articulating what’s really going on. “The truth must dazzle gradually,” she said. If it hits us too fast and hard, it may be difficult to digest. So did Emily suggest that we should lie and deceive? No. 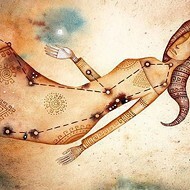 “Tell all the truth,” she declared, “but tell it slant.” This is excellent advice for you in the coming days, Aquarius. PISCES (Feb. 19-March 20): Here’s my report on your progress. You are not struggling to embody a delusional state of perfection as it is imagined by other people. Rather, you are becoming an ever-more soulful version of your idiosyncratic self, evolving slowly but surely. You are not dazedly trudging along a narrow track laid down by thousands of sheep. Instead, you are lively and creative as you bushwhack a path for yourself through the wilderness. To celebrate this ongoing success, Pisces, I suggest you get yourself a new power object that symbolizes your inventive devotion.